Scope staff member and long-time customer Irene Kwong looks back at her time with Scope, and talks about how, when all the other doors were closed, Scope became the home she was looking for. Scope’s 70th birthday is a time for celebration, and reflection. It is a time to remember our wonderful staff and customers who have paved the way for us. We recently spoke with Irene Kwong, a longstanding staff member and customer of Scope. 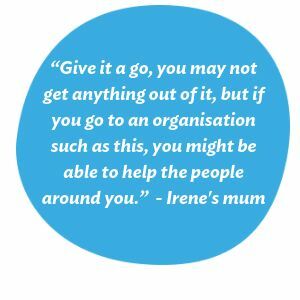 Irene was dependent on people assisting her throughout the day, which hindered her significantly when it came to finding work. Fortunately, her father owned a Chinese restaurant, and for the next four years she worked in the kitchen. “Packing 200 dozen Dim Sims a night is not easy with one hand!” Irene chuckles. At twenty three, Irene and her mother went to her commonwealth health assessor. “For your own good you should go out into the community,” they advised. “Give it a go, you may not get anything out of it, but if you go to an organisation such as this, you might be able to help the people around you,” her mother said. If she wanted, she could attend the Northern Districts Day and Lifestyle Options, but she was apprehensive. It was Irene’s social worker who encouraged her and, 52 years later she is still here! Irene moved to Maribyrnong Highpoint Industries and took a position of the new “Employee Representative Committee”, helping with employee needs. She has been a Director on the Scope board, President of the Highpoint Industries Employee Committee, and was awarded Life Governorship. Irene is a valued customer and member of staff. She knows the organisation from the bottom up and is there for anyone who needs her. She is, and will always be an inspirational advocate for people with disability. On the occasion of our 70th Birthday, we’d like to thank Irene for all her hard work and sheer determination to never give up. Irene’s been a great inspiration for all of us.